Looking for a "splurge" dessert/cocktail? This milkshake is two-in-one! 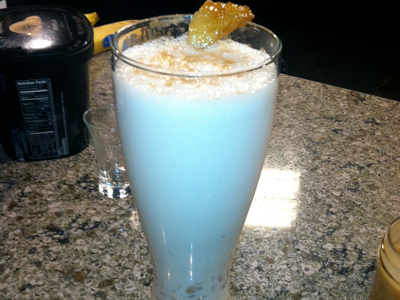 A caramel banana milkshake with whipped cream vodka! In a medium sized pan over medium-high heat, combine butter and brown sugar. Now add bananas, and cook for about three minutes. Add nutmeg and cinnamon and set aside. In a blender, blend ice cream, milk, vanilla and vodka. Add all but one or two bananas (save for garnish). Pour milkshake into glass then top with whipped cream and drizzle caramel sauce on top, garnish with a banana.